Have chinks appeared in Mercedes Armour? A dominant performance throughout practice, qualifying and the race itself. An established champion easing to victory. It sounds like a typical Hamilton-led Mercedes performance, but yesterday this was very much not the case. Instead, it was the scarlet Ferrari of Sebastian Vettel that controlled the race, having taken pole by half a second from Red Bull’s Daniel Ricciardo (yes, you read that right – Red Bull, in second). Kimi Raikkonen was third and Danil Kvyat fourth, so where were the usually untouchable Mercedes cars? Hamilton could only secure fifth on the grid, with Nico Rosberg sixth. At the start of the front runners got away more or less in their starting order and began to peel away from the pack, but Mercedes were not showing any hidden pace and began to drop away from the Ferraris and Red Bulls. 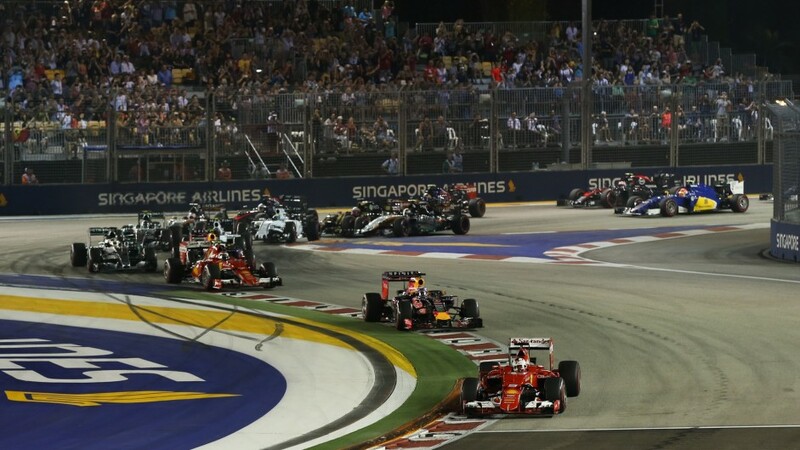 It was becoming painfully clear that Hamilton and Rosberg just couldn’t live with the cars ahead, and that Singapore would be damage limitation. Vettel’s steady charge away from the rest of the pack was twice interrupted – the first time when the Williams of Felipe Massa and the Force India of Nico Hulkenberg came together as Massa came out of the pits. It’s this particular fan’s humble opinion that Hulkenberg just didn’t give Massa enough room, squeezing the Williams as he tried to go around, and misjudged just how far he was turning in. 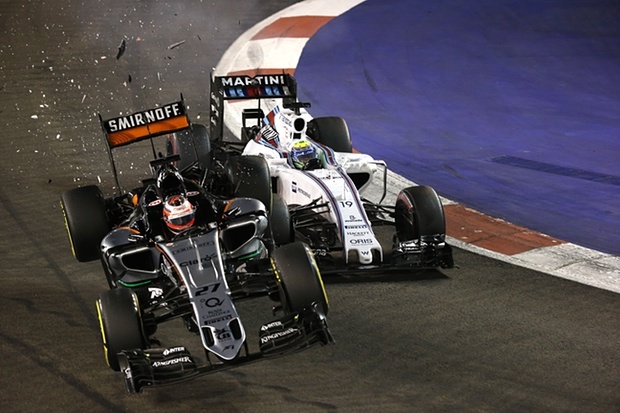 Hulkenberg bounced over Massa’s wheels and spun into the barrier, ending his race. Whilst the safety car bunched the field back up, Vettel controlled the restart brilliantly, peeling away from Ricciardo with ease. The inevitable pit stop rush that a safety car triggers caused problems for Ricciardo’s Red Bull teammate Kvyat, who fell behind Hamilton and Rosberg, and was unable to get by Rosberg for the remainder of the race. Hamilton would start to suffer problems with the energy recovery system on his car, losing power and dropping back through the field, before eventually retiring on lap 32. A lap later, Fernando Alonso suffered yet another retirement, a gearbox failure ending his race (something that also force his teammate Jensen Button to retire on lap 52). The second safety car spell was triggered by a very unusual and frankly scary incident on lap 38 when a man was spotted taking a stroll down the side of the track! Needless to say, the potentially very dangerous circumstances required the safety car to slow the cars down, and the man eventually climbed over a barrier and out of danger (and was also arrested!). 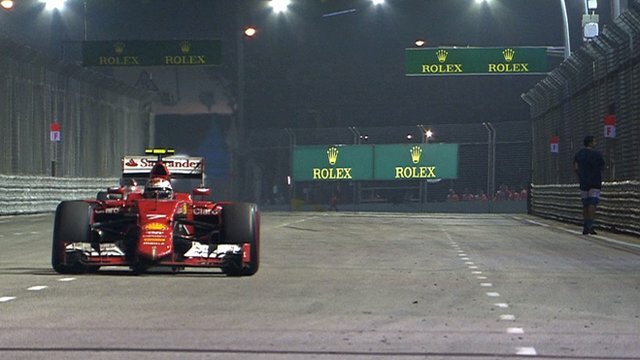 Once again, Vettel aced the restart, moving on to take a comfortable victory. Behind Vettel, there were a few more thrills and spills to be had. Button drove into the back of a slow-reacting Pastor Maldonaldo as the latter came out of a corner, prompting some uncomplimentary remarks from Button about Maldonaldo’s mental state, and Max Verstappen (who, having stalled at the start had found himself a lap down after just one lap) managed not only to unlap himself (helped by the safety cars), but also pulled off move after move on the cars in front to push his Toro Rosso up to eighth, with his fellow rookie and teammate Carlos Sainz also getting into the points, right behind Verstappen in ninth. At one stage Verstappen was asked to let Sainz by in a bid to let Sainz attack Perez, but he refused, in a moment of what some might view as inexperience, though to be fair to him, he did make a good case as to his reasons afterward. Vettel’s performance was a commanding one, reminiscent of the many controlled wins he had for Red Bull, and in fact his 42nd career win moves him ahead of Ayrton Senna and into third on the all-time win list. To me though, Verstappen’s charge up the pack was the performance of the day. So what does the race mean for the title race? There are six races left and 150 points left to grab. Vettel’s win, combined with Hamilton’s retirement and Rosberg only managing fourth place, means Vettel is 49 points behind Hamilton, whilst Rosberg is 41 points behind Hamilton. Hamilton still has a one win advantage over Rosberg and he took wins at the Japanese, Russian and US grands prix last season, so he may well be relatively unconcerned, but Mercedes might be a little worried at their complete lack of pace at Singapore. The next track, Suzuka, is a fast circuit that might well play to their strengths, but they’ve been completely off their game at Singapore, and it will be interesting to see if this the start of a blip.